By the release of our third Resident Evil game in 1999, we had all gotten fairly accustomed to the series and its characters. No longer did Resident Evil have that daring, fresh and magical feel to it, but it was certainly still making good games, and Nemesis was pretty fun up until the point that I got trapped with inadequate ammunition on a boss I couldn't hope to beat on my only save file. Oops! The interesting thing about the third game's monsters is just how few of them there actually are, but they sure did aim for "quality over quantity" here! 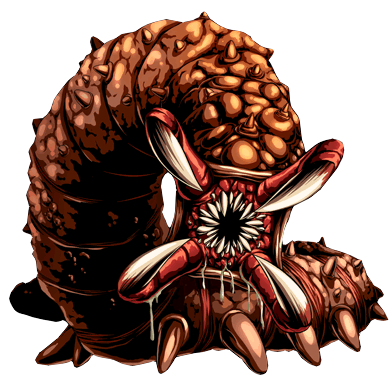 Worm monsters are always cool, even if their designs can get a little samey, and I was pretty pleased to see them added to the Resident Evil universe. Perfectly green, slimy, warty and slithery, the Sliding Worms have that "petaled" mouth I loved so much at the time, which only really exists in nematode worms, though a nematode's mouth never has more than three lobes. 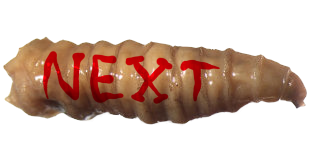 Like earthworms, the sliders are burrowers, but like leeches, they latch on to victims and drain blood! We have to use newer artwork for this one, since I'm having a heck of a time finding the original illustration in any decent quality, but it eventually turns out that the Sliding Worms are nothing but little "larvae" to these HUGE crawling monstrosities! 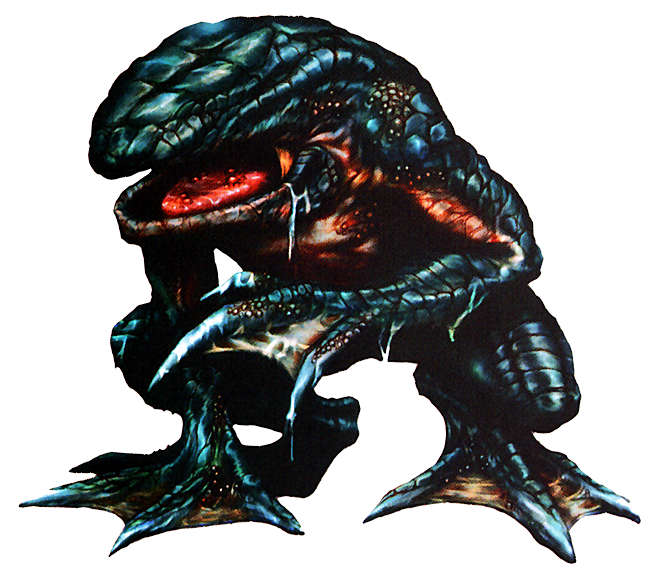 More grub-like in appearance with dozens of teeth, stumpy little legs and well defined segmentation, only two of them appear in the whole game, and while slow, their bite attack inflicts the most damage of anything you'll face, not counting monsters with an "instant-kill" animation. The silly thing about the Gravedigger, though, is that it's officially supposed to be a mutated "millipede." HOW?! There isn't anything remotely millipede-like going on here besides a tubular, segmented body, and there's certainly no reason millipedes would have limbless, unsegmented, leech-like larvae. You could argue that the T-virus simply messes them up that badly, but it's so much easier to just say these are mutated annelids. Nemesis most notably introduces the idea of Hunter variants with entirely different designs. The Beta is a little smaller and weaker than the more crocodilian Alpha we're familiar with, but as you might have guessed, this also means it can move a whole lot faster. The asymmetrical limbs and the cancerous tissue are a nice touch for a creature that's supposedly also a cheaper, hastier model of bioweapon, a little less stable and healthy than the original Hunter! Delightfully nicknamed "The Frogger" by Umbrella researchers, the Gamma is apparently an experiment by their European division to produce an amphibious bioweapon, combining human and frog DNA with the T-virus. This doesn't quite explain why it's scaled more like a crocodilian, which I'm going to headcanon was also thrown into the mix, because I love the idea of a hard-scaled croco-frog. The lack of either teeth or eyes always stood out to me, and isn't even the only eyeless frog monster in either Resident Evil or video games in general. All actual frogs have eyes, but frogs with only mouths keep cropping up in fiction, I guess because it just looks that eerie. Now we're REALLY talking! 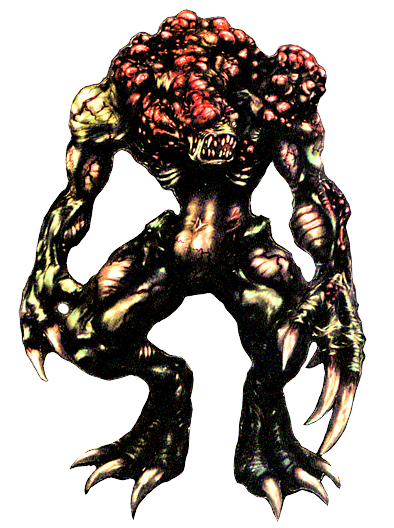 The Drain Deimos is a mutation of a flea, one of my favorite animals and grossly neglected by most monster-centric franchises. 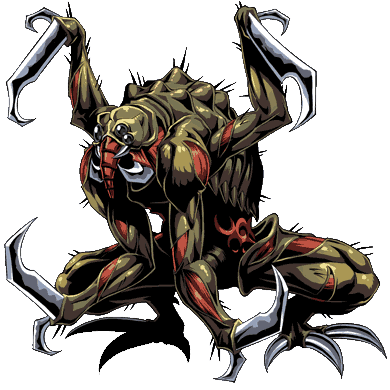 They supposedly result from normal fleas that fed on the blood of zombies, though given how dense a flea infestation can be, there really should have been tens of thousands of these things infesting Raccoon City since day one, even moreso given that the Deimos is said to be entirely female and parthenogenetic! You can really see the flea aspects in this otherwise fanciful creature, too, most of all in its prickly, segmented back, hunched body shape and beady eyes. It's a shame they don't have the absurdly flattened shape of an actual flea; a monster that's virtually paper-thin from head-on would be pretty unnerving, especially when it can use narrow crevices as shortcuts to cut you off and ambush you! Unusually, we're even given official explanation for why the Deimos is so "grotesque," its body apparently growing and mutating slightly faster than it can properly molt. We didn't need that explanation since we're already in a setting where hideous, random mutation is a given, but I appreciate the detail. As wonderful as the Deimos are, the Brainsucker is even better! They're not explicitly referred to as fleas, but they're said to be "closely related" to the Drain Deimos, so I guess they'd have to be, and they're even seen sometimes with little babies that leap around! These apparently result from the insect feeding on other, non-human viral mutants, and as their name implies, they attack the cranium and attempt to slurp out brain tissue! 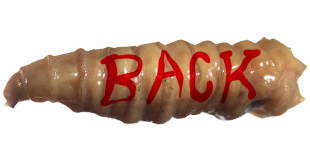 With glassy eyes scattered throughout a gnarled, twisted body, two faces and mouthparts like squiggly pink fingers, the brainsucker is one of the most alien looking creatures in the franchise, which feels highly appropriate for a brain-eating mutant bug. This series really goes the extra mile to explore almost every monster trope that it possibly can. 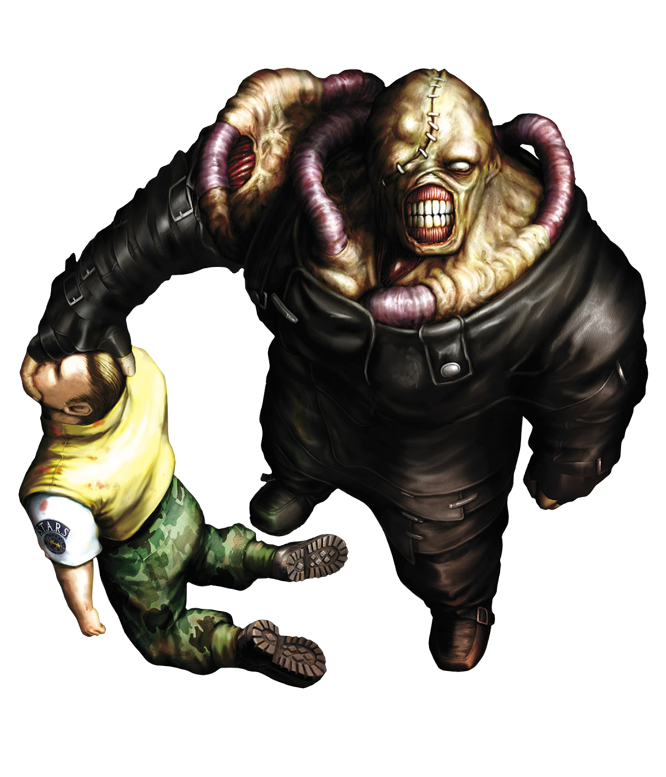 Finally, we have the star of the show, and what many consider the most iconic "villain" of the Resident Evil universe. Unlike previous Big Bads such as the Tyrant or the mutated Birkin, the Nemesis is a monster intelligent enough to actually wield weapons, strategize and calculate, with a mind that can be programmed more like a machine than a living thing. 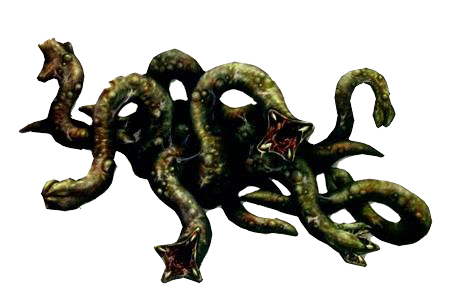 More remarkably, the Nemesis houses a giant parasitic organism - the source of those hose-like tentacles winding through the monster's flesh - whose chemical secretions further enhance its intelligence, strength and regeneration rate. Seemingly unstoppable, the Nemesis even manages to survive being immersed in acid, dissolving down to a slimy heap of meat that makes one final, distorted attempt to regenerate itself and seems to become one with its internal parasite. The result is this shambling mess of tentacles and boils that can only drag itself, and sports an enormous "beak" of ragged, deformed bone. Like I've said before, this kind of "unstable" blob-mutant is still one of my favorite monster archetypes, and I appreciate how often this series returns to it. 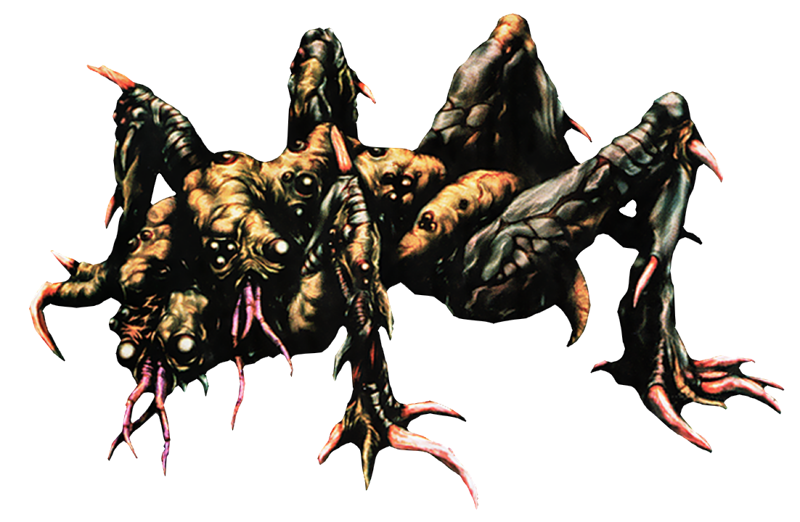 It's just not a proper Resident Evil game if you never have to fight one big, giant teratoma! The popularity of the Nemesis would have quite an impact on the rest of the series. I don't think it was planned to be ahead of time, but the parasite manipulating the Nemesis would eventually prove to be a bit of foreshadowing, in retrospect, to an entirely new focus and pretty surprising plot twist.